This is a special Dr. Dobb's Tech Digest with two special-interest articles. 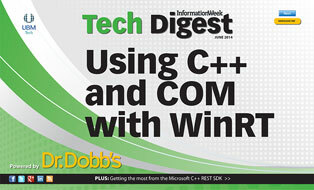 The first discusses using C++ and COM with WinRT, particularly in the context of the world of Windows Store Apps. The second article is an overview of using the Microsoft C++ REST SDK while in Visual Studio, which enables you to stay in C++ when consuming REST services. Working with C++ in the world of Windows Store Apps. The C++ REST SDK takes advantage of the capabilities introduced in C++11 to simplify cloud-based coding with a modern, asynchronous, and multi-platform API design. The information submitted is collected by UBM Tech.